Police released photos of a woman wanted for questioning in the incident. Oklahoma City police were looking for a woman they want to question in connection with swastikas and other racist graffiti found at the state Democratic Party and Chickasaw Nation buildings in that city. The graffiti was found at the Oklahoma Democratic Party headquarters and a Chickasaw Nation office, officials said. The spray-painted messages included the Nazi symbol, the numbers "1488," which is frequently used by white supremacists and refers to Adolf Hitler, and anti-Chinese slurs. The Democratic Party and the Chickasaw Nation condemned the vandalism, as did the city’s mayor, the governor, two Congressman and others. "One bigot with a spray paint can or even a group of bigots do not speak for the hundreds of thousands in this city who stand strongly together against hate & bigotry," Mayor David Holt, a Republican, said in a tweeted statement Thursday. "Let’s love each other just a little bit more today." Police released photos of a woman they are seeking for questioning in the incident. "It is very disheartening to see our building defaced by this type of hateful message, which is so out of place for Oklahoma," Bill Anoatubby, governor of the Chickasaw Nation, said in a statement. “We believe it is important to move past this isolated incident and focus our attention on the important work we do." Republican Gov. Kevin Stitt called the vandalism "abhorrent." U.S. Reps. Tom Cole and Markwayne Mullin, both Republicans and Native Americans, condemned the images. "As a member of the Chickasaw Nation, I am absolutely disgusted by the racist vandalism on my tribe’s Oklahoma City Area Office. I was also sickened by the incident at the Oklahoma Democratic Party headquarters,” Cole said. "There is no place in our communities for such despicable symbols and language so clearly meant to threaten other human beings and those with differing points of view," he said. Mullin, a member of the Cherokee Nation, also released a statement. "These actions at both the Oklahoma Democratic Party headquarters and the Chickasaw Nation Area Office are disgusting and will never be tolerated," he said. 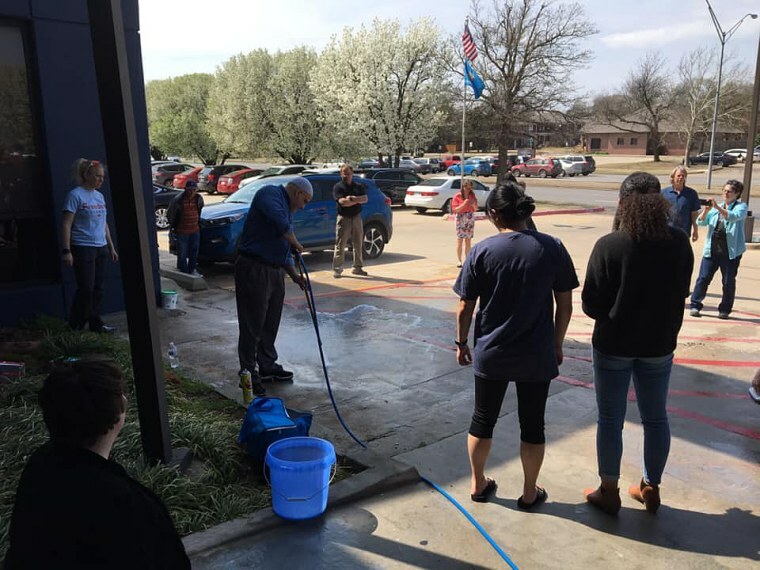 The Oklahoma Democratic Party said it was "devastated by the recent hate crime attack at our Headquarters this morning" and a cleanup was organized. "We appreciate the outpouring of support for this cowardly act as the community comes together to denounce hate and bigotry," the party said in a statement.